With my 30th birthday on the horizon, I decided it was time to start doing a little more exercise so I joined the Northowram Puma’s and entered the local Overgate 10k on 17th April. My aim was to run a sub 55 minute 10k (to prove I wasn’t over the hill!). 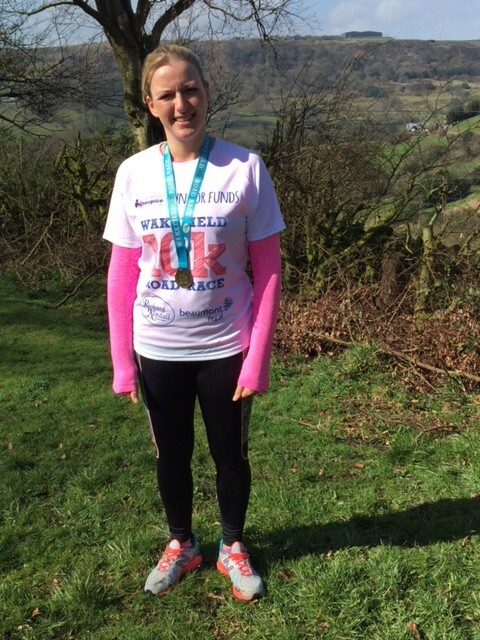 I was then told that Overgate is really hilly, so I had a rethink and entered the Wakefield 10k on 3rd April on the understanding that it was relatively flat. Walking into that first Puma’s meeting on a cold dark Wednesday in January was daunting and the biggest hurdle I’ve had to overcome so far. However my fears soon disappeared – everyone is so welcoming and friendly that there really is nothing to worry about. After a few weeks in group 4 with Ian running between 3 and 4 miles each week, I took the step up into group 3 in early March knowing I needed to up my miles. Ally (group 3 leader) likes hills and off-roading which has helped up my fitness. I also braved a couple of Sunday morning long distance sessions with the club. I set off to Wakefield at an early hour in the cold and fog, questioning my sanity. I’d lost my running wing man due to injury so had to brave my first real ‘race’ with just with my husband as chief supporter. The event was well run and as I had registered early I‘d received my number, timing chip and details in plenty of time so got organised the night before. This was good forward planning as we ended up walking an extra loop of the park to the start and everyone was just filtering down to the line when I arrived! I left my supporter and wiggled my way through the crowd to about ¼ of the way back – completely selfish but I’d been told it’s easier to let people over take you than to have to dodge people yourself! So the theory that the course is flat is not quite right – the start and finish lines are on a hill and it is undulating throughout! But it is a straight out and back course so no repetitive loops that mentally flaw me. I know that I set off too quickly and I was delighted to reach the turnaround point and water station where I gathered myself for a few seconds before pressing on – I had a time to beat after all! Thankfully the sun came out at this stage too. Kilometres 6 to 9 seemed to go on forever but knowing I’d overtaken the 55min pacer kept me going. The finish line was on top of the hill and required one last dig supported by a lonely cheer! My official time of 51:31 came through an hour after finishing and I kicked myself all day for not pushing a bit harder – next time I’ll be chasing the 50min pacer!